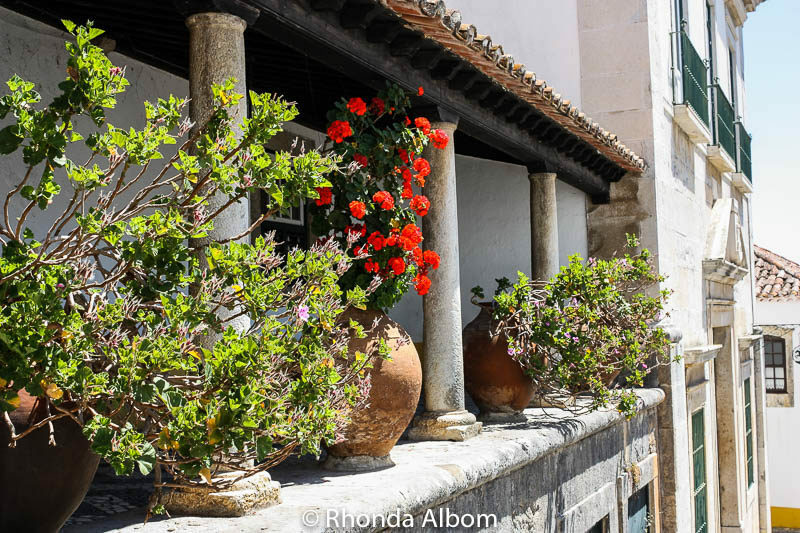 Portugal is a treasure trove of small, picturesque medieval towns like Obidos. It’s a charming walled city whose highlights can be seen in just a few hours. 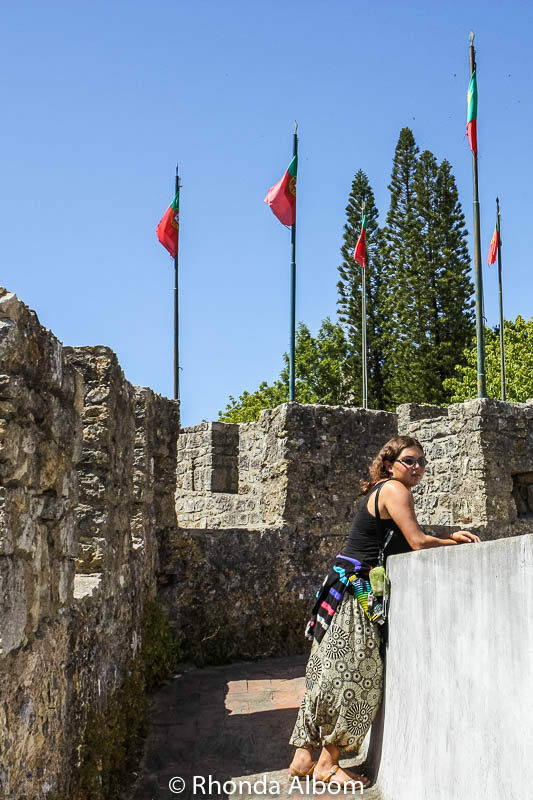 At only an hour’s drive from the capital, it is ideal for a day trip from Lisbon. 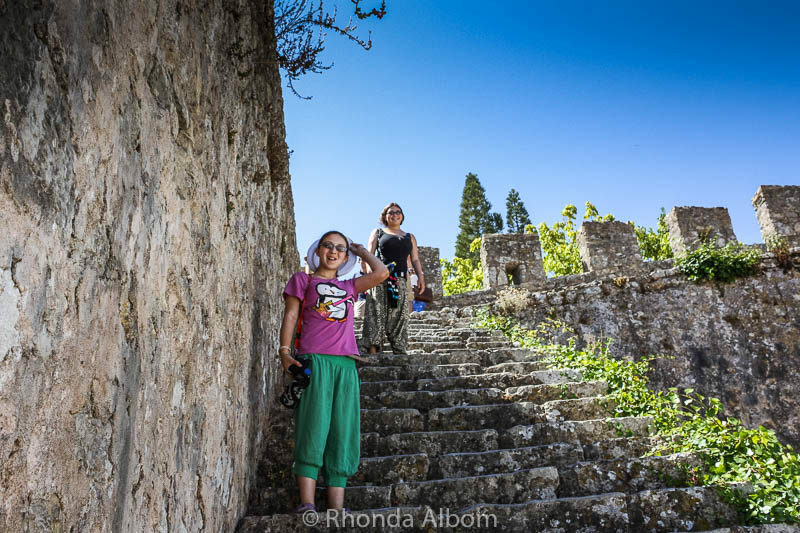 While a day tour from Lisbon to Obidos would have spared us from a bit of confusion, we would have sacrificed our story: The sun was nearing the horizon as we drove up the narrow, windy, cliff edge dirt road that leads to the walled city of Obidos. The road was a bit nerve-racking, but when we reached the top, the real problem was staring us in the face. The closed Obidos city gates had a padlock and chain holding them tight. The sign plastered across the former entrance informed us of an upcoming Medieval Fair that starts in four days. Our pre-paid apartment was inside those gates, the ability to turn around was difficult, and darkness was descending. However, we made our way back down, parked the car outside a pedestrian gate, and found our apartment. We shared a laugh with the proprietor, and he shared a Ginja with us. Then he went with hubby to move the car just outside a nearby walk-in entrance. It was a long day. We opted for dinner and an early night. 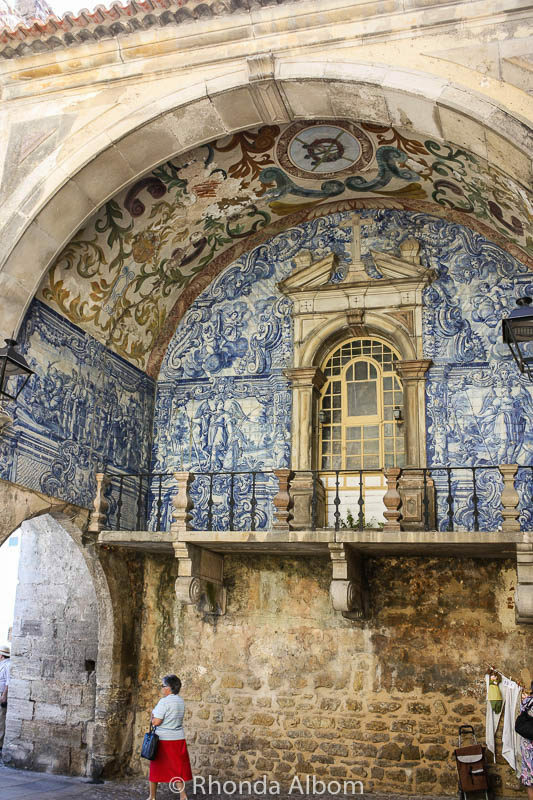 Inside the main (south) gate into Obidos is Porta da Vila, a small Baroque chapel decorated with traditional azulejos tiles that depict the Passion of Christ. Called Porta de Vila, the main gate into Obidos contains this intricate 18th-century tiled chapel depicting the passion of Christ. 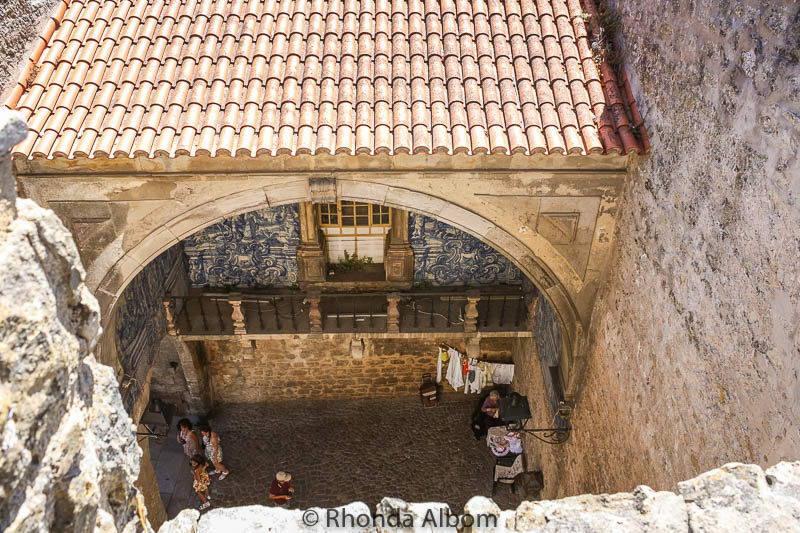 Looking down onto Porta de Vila, we get a different perspective. 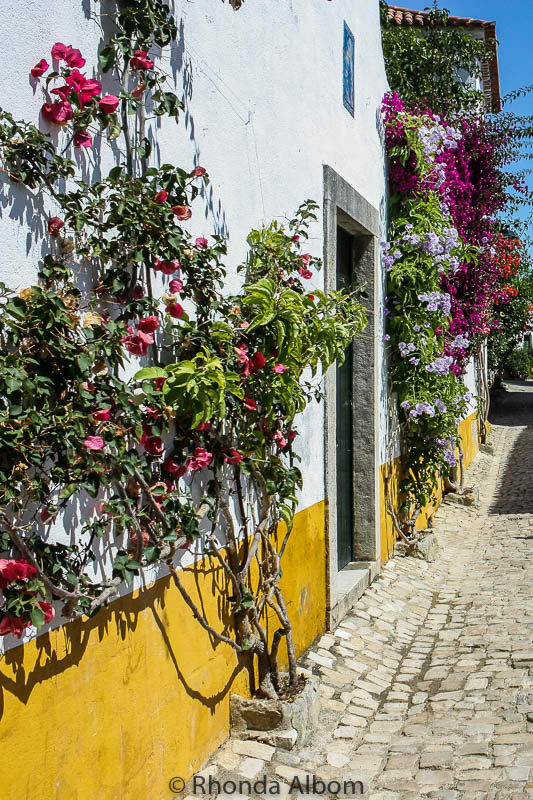 Fragrant and colourful flowers climb on the houses and shops along the Rua Direita, the main street in the old town. One of the several sets of steps that lead to the top of the city wall. View of the terracotta tiled roofs from the rim of the wall. Our teen enjoys the view from the city wall rim. While some parts are narrow, missing any safety rail, or otherwise unnerving, the wall is intact and the perimeter can be walked in about an hour. Also from the rim, this time we are looking outside the wall at the lush green gentle hills that seem to define many of the regions of Portugal that we visited. You can see the Santuário do Senhor Jesus da Pedra outside the wall. Ginja is a local speciality sour cherry liqueur that was initially made by Benedictine monks. For hundreds of years, the recipe remained secret until the 20th century. Ginja (more officially called Ginjinha) is now made only in the Obidos region. Ginja is even better when served in chocolate cups. After drinking the cherry liqueur, we ate our cups. The Church of Santa Maria da Obidos was erected in 1148. 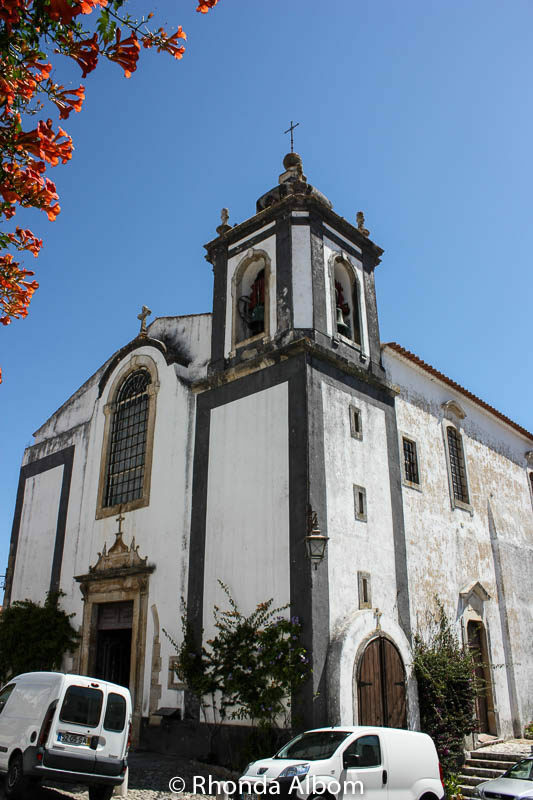 The church is best known for a wedding in 1441 between 10-year-old King Afonso V to his 9-year-old cousin, Princess Isabella of Coimbra. It is a date, rather than a street number. Another example of the flowers that seem to be everywhere. 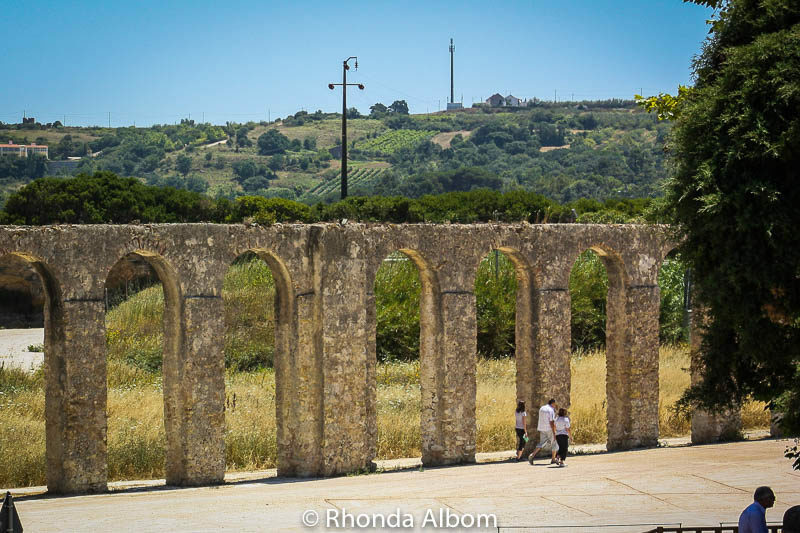 On the outskirts of the city is a 16th-century fully intact aqueduct. While not nearly as dramatic as the Segovia Aqueduct, it is still quite impressive. Fantastic and far off views will reward your efforts if you climb the stairs in the tower along the wall. Visit the Obidos Castle (any time of year other than the few days before the Medieval festival). If you plan well in advance, you can stay at the castle as it is now a hotel. Enjoy the Museu Municipal de Óbidos, the local art and municipal museum. Play golf at one of the two nearby courses. Note: there is no Obidos parking (or driving) inside the city walls. In fact, there is only one car park, and it sits outside of the main gate to the south. The Medieval Market and Festival takes place at the castle for three weeks each July. The next Obidos Medieval Festival takes place from July 12 to Aug 5, 2018. The Obidos Castle closes for a time before the event, so we didn’t get a chance to enter. We did enjoy a medieval festival in the medieval portion of La Coruna Spain. This delicious event takes place in April or May each year. The 2019 dates are not yet announced. Check their website for details. Obidos is a town that can be enjoyed in just a few hours which is what makes it such a popular day trip option from Lisbon. Not only is a guide interesting, but you can also avoid the hassle of parking in Obidos. Casal Da Eira Branca – this is where we stayed and where we recommend. There are hotel rooms as well as apartments, all rustic, decorated with local wood, natural stones and tiles. Modern amenities and a shared kitchen for those who want to use it. We stayed in a huge two bedroom apartment with our own kitchen. Pousada Castelo de Obidos – this is the castle and generally requires booking well in advance. With modern facilities, castle room features, and breakfast included, it is your chance to stay in one of the seven wonders of Portugal. Or, if you want something different, check out other hotels in Obidos at Booking.com or on HotelsCombined. We entered Portugal from the west, our first stop being Evora followed by Sintra, Obidos, and Alcobaca before driving north and returning to Spain. Have you been to Obidos? 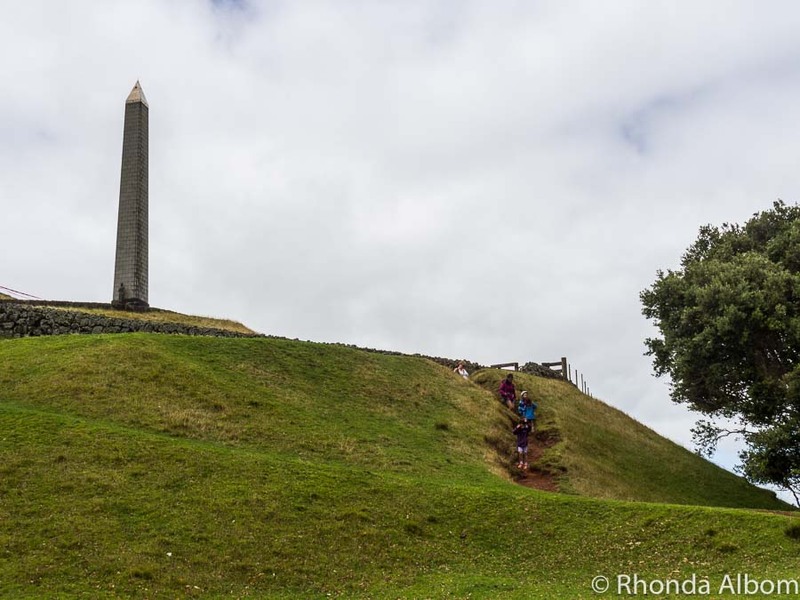 Previous Post: « One Tree Hill an Auckland Icon, but Where’s the Tree? 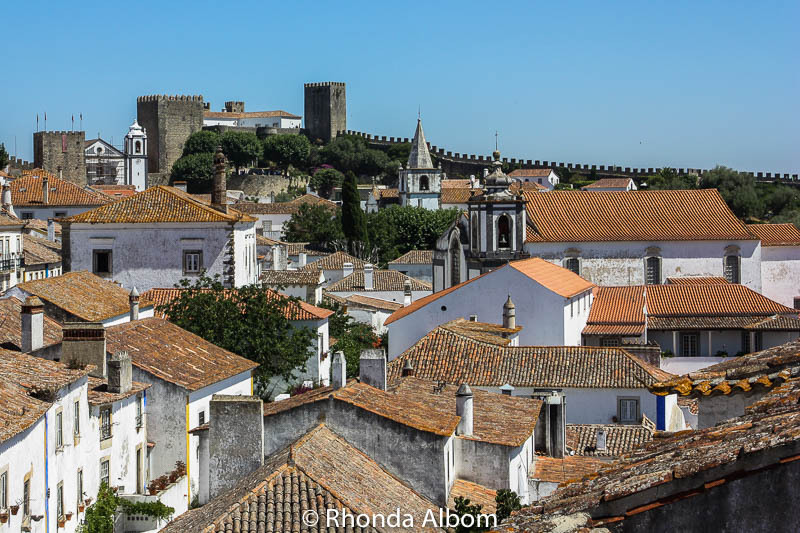 Obidos looks like a charming Portuguese town that makes for an enjoyable day trip from Lisbon. Definitely, think I’ll visit Obidos when I head down that way now. The gorgeous historic center and its labyrinth of cobblestoned streets and flower-bedecked, whitewashed houses livened up with dashes of vivid yellow and blue paint, call out for an enchanting stroll. 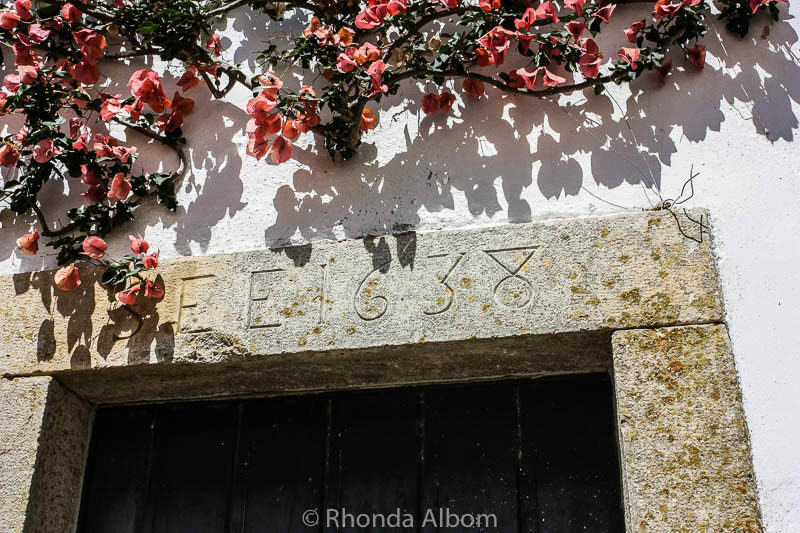 I think you will love Obidos, especially with your choice of flowery words to describe the photos. Thanks for bringing in another place close to the capital of Lisbon. I loved the charm of Obidos, which are reflected in your beautiful pictures. The city looks like a perfect place for a lazy vacation. Ginji looks too tempting! Ginja is fantastic. I wish I brought some home with me. The parking situation sounds challenging but oh what a beautiful place. Looks like somewhere to spend a week or more. Love Portugal! Truth be told, there is a huge parking lot outside the walled city. We just didn’t read enough before we arrived, as we were so taken in by Sintra. Plus we arrived much later than we had thought, again due to Sintra. It’s not that big, you would find your way again. If I remember correctly, cars were not driven in the old town. Pretty place! I love how the flowers frame so many of the photos. I loved how the flowers framed so many of the walls. I LOVE city walls! I can’t get enough of them. 😀 It’s great to know that they don’t take ages to trek. This one is a bit scary in spots, but walkable. Thank you so much for the tour, i had fun and been informed. I smiled at eating the cups after drinking the content. Of course the photos are always awesome. I would like to share this in my FB wall for my friend who missed Portugal. Of we ate the cups, they are chocolate. What else would we do with them? And, yes, please share this anywhere you would like. Such a lovely town! The traditional houses and buildings are always fascinating. 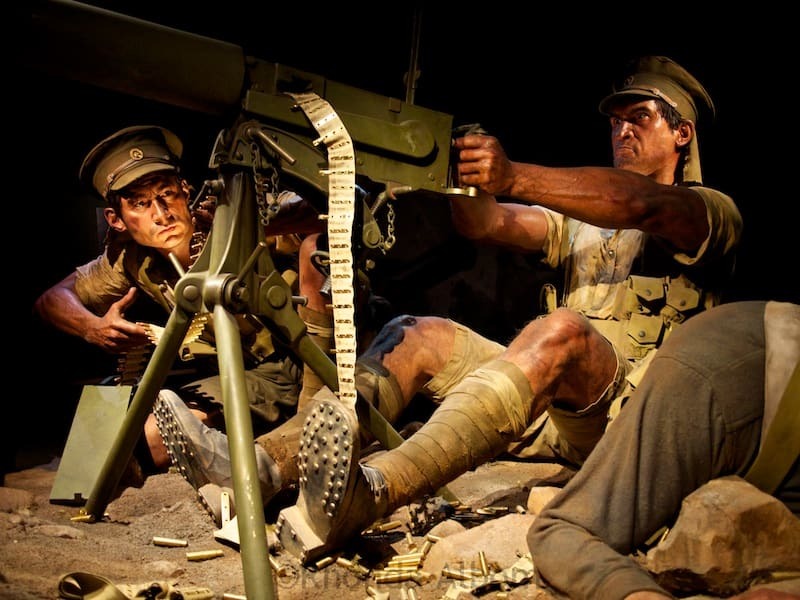 It tells us history as well as its beauty. Everything seems magical and comes from a different time! Looks like you and your family had a great time exploring the town! If you do love a traditional place you guys definitely should come and visit Bali. The traditional life is still thick! You’d love it here, so come and please do check our website out, thank you. I had my first exposure to Indonesia a few months ago with only one day in Bali. And you are correct, I loved it. We spent most of our time in Ubud and I cannot wait to go back. of magnificent memories from your travels. We have been having some pretty dreadful weather too. Nothing like a tropical storm to keep you indoors for a while. This wall doesn’t feel as safe as some of the others we have walked around, but it was equally as exciting. I love the old cities. Your beautiful photos transport us to magical places…as always. Yes, and Portugal kept surprising us. Majestic! Well seen and well taken. What a beautiful and wonderous place to travel. Very nice pics, thanks for sharing. Thanks Patrick. It’s a fascinating little town. Lovely – you go to the most wonderful places! 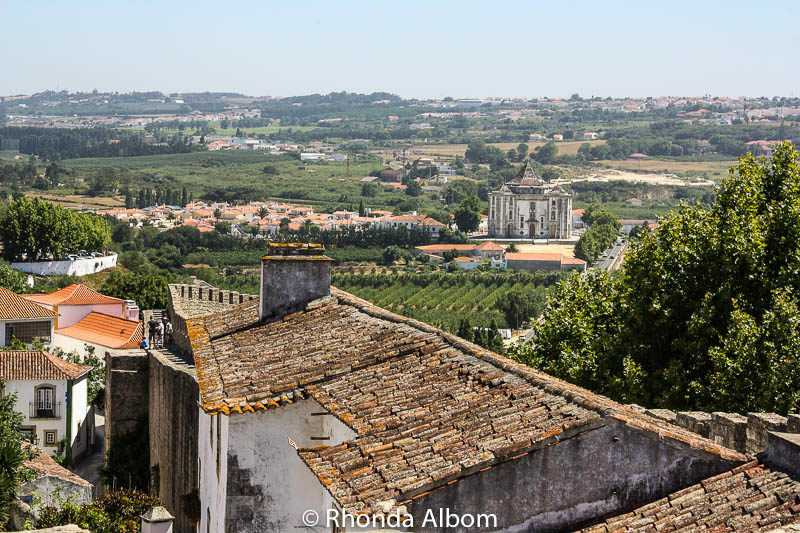 I was in Obidos two years ago – it’s lovely! 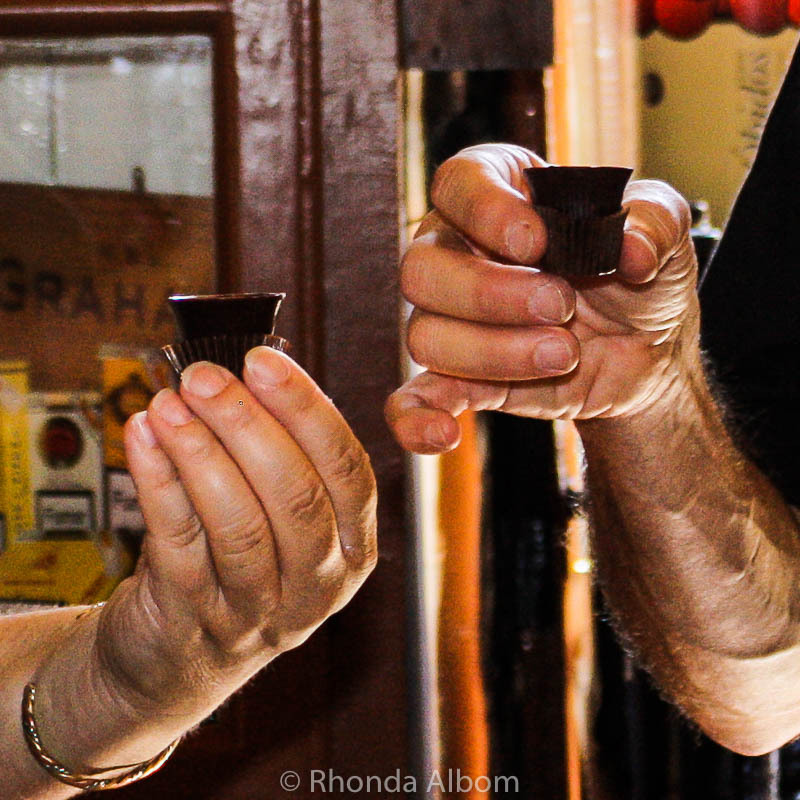 I love the ginja in chocolate cups… Gorgeous shots. The ginja in chocolate was wonderful. It’s a bit farther off the beaten track, depending on where you are headed, but worth a visit. We were heading back to Spain to the North, so it was on our way. That sour cherry liquoir sounds amazing! it makes me want to visit Obidos tomorrow! I wish I had bought more, that’s for sure. Completely encased by a wall, the city streets have almost no auto traffic, making them even easier to walk. I love that blue and white tile! So pretty! Imagine if we had done it correctly, that would have been our first view of the town (rather than the locked gates). It is beautiful indeed! I love looking at all those pretty details in this beautiful town. That tiled chapel is pretty! I like the details too. Yes, my girls enjoyed it all, although they didn’t get to try the Ginja. Too bad, it was delicious. So many intriguing buildings here in Portugal. Love the art of stonework. And the gorgeous sunlight highlights the beauty of all those flowers. I was pretty impressed with Obidos as well. oh a medieval fair, how exciting! Me too. We only touched on the country. What a lovely place to visit. I will never go there, but you already know that. Some are meant to travel and I’m not one of them. That’s okay, I am happy to take you with me in photos. I was just glad you travelled to meet us in San Francisco. This looked like an amazing trip! The liquor filled chocolate cups really caught my attention. I love your photos too. Hopefully someday we will make it to Europe. Thanks for sharing your journey with us. LOL – that liquor filled chocolate cup photo is well cropped. It is possibly the worst photo I have of hubby and I when we are trying to look good for the camera. I am glad it works in its tiny format. Too bad you missed the Medieval Fair. I bet it would be awesome in such a scenic place. At least you made it inside despite padlocked gate and enjoyed lots of lovely sights! I know, and it was the same evening that we visited Sintra, a town that was having a medieval fair that we didn’t stop at as there wasn’t time to do it all. I was not popular with one of my girls on that day. Of course, we would have had to plan for Obidos overnight during the fair well in advance, something we are not too good at doing. Thanks Laura. It’s a lovely town. Looks wonderful. I think the more you travel, especially in fascinating places like this, the harder it will be to stay put in somewhere like Auckland. Well at least it will make you want to spend several months of the year travelling. Beautiful town. Love the wall.